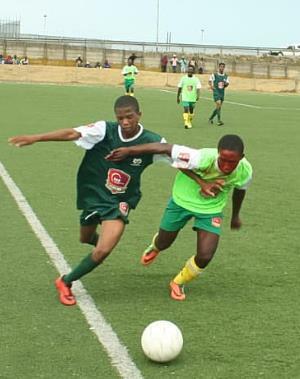 Knysna Celtics' Luvuyo Ngcaca (in bright green) tries to stop Nkosothando Faku of Young Pirates (dark green) on the ball. 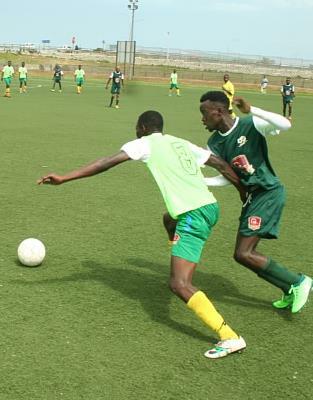 GEORGE FOOTBALL NEWS - Young Pirates, the youthful side from Thembalethu, recorded their first big win in the Safa Eden Promotional League last Saturday. In a classical performance at the Lawaaikamp stadium, they claimed a 5-2 victory against Knysna Celtics to gain three league points. The goals were scored by Nkosothando Faku, Mooi Samnkelo, Phakamile Someleze and Siphelele Booi (2) for Young Pirates, and by Anele Niyake and Sinethemba Zicina for Knysna Celtics. The first half was marked by scintillating play. Driving hard, Young Pirates wings Matwa Luxolo and Nkosothando Faku tried to create chances for their forward, Someleze Phakamile. Celtics' middle, Thembile Mbandeni, was working overtime to deal with Matwa's speed while their left back, Ngcaca Luvuyo, defended very well, fighting off Faku on the left wing. Young Pirates put the first score on the board when Faku capitalised on the work of central middle fielders Bhukuza Wongekikle and Kayizana Sinenkosi, breaking the net with an excellent goal. Knysna Celtics came back with a goal by Zicina Sinethemba to equalise the score and the exciting first half ended 1-1. Despite Knysna Celtics' target man failing to convert opportunities created by Thembile Mbandeni several times, the second half brought most of the goals. Pirates launched an attack with Phakamile Someleze breaking Celtics' defence to score the second goal for his side, followed by a third goal from Mooi Samnkelo. 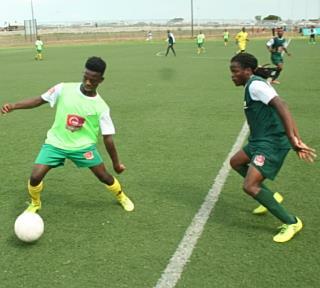 In response, Celtics' Anele Niyake scored with a long-range shot, making the score 3-2 for Pirates. With the game warming up both sides were pushing for more goals. Siphelele Booi scored Pirates' fourth goal with a long-range shot from the centre of the field, soon following it with another to clinch the game for Pirates on 5-2. Knysna Celtics jersey no 8 (bright green) Thembile Mbandeni wards off an attack by Young Pirates' midfielder Luxolo Matwa.